Egyptian activists are calling for two days of solidarity action outside Egypt on June 20-21 to highlight repression and mobilise support for the campaigns to free political prisoners. Read the call for action here. 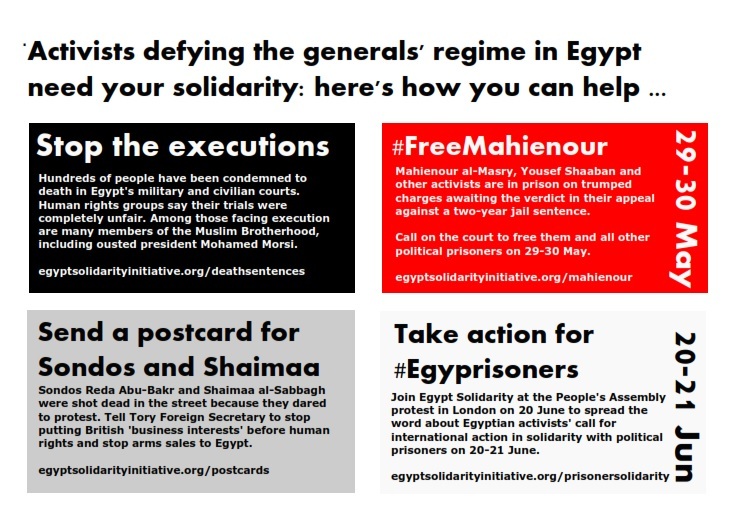 In the run-up to June 20-21, we are asking Egypt Solidarity supporters to help us spread the word about what is happening by taking the four steps below. If you can help organise a protest, meeting or social media event please get in touch via campaign@egyptsolidarityinitiative.net. If you are in the UK, download a leaflet here to use in your workplace or university.